Cartagena's Spanish colonial architecture and Caribbean breezes charm all who enter her fortified walls. The city's historic center, designated as a UNESCO World Heritage Site, is one of the most romantic places in all of Latin America. Expect to sweat, as the tropical humidity spares no one, however once the sun goes down, walking around the old cobblestone streets becomes a much more pleasant affair. 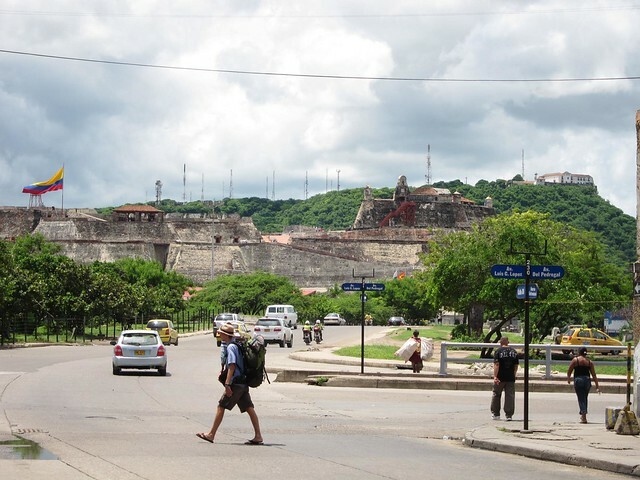 Cartagena's Rafael Nunez International Airport (CTG) is located about a 15-minute drive from the hostels of barrio Getsemani, and the historic city center. Major airlines serving the city include Avianca, Aires, COPA Colombia, and Spirit Airlines which has direct flights from Fort Lauderdale, Florida. To get to your hostel or hotel from the airport, take a taxi for about 10,000 pesos ($6). Cartagena's main bus station is 6km from the city center, and offers regional and long range buses to destinations around the country. Buses leave for the 2-hour trip to Barranquilla almost hourly, and it's a 4-hour ride to Santa Marta further east along the coast. It's about a 12-hour ride to Medellin. When leaving the city, you can usually show up and find a bus departing within a few hours for wherever you're headed, especially if it's another major city such as Bogota or Medellin. The exception is national holidays such as Semana Santa in April and the month of December, when larger number of Colombians are taking vacations. Sailing from Panama to Colombia is a popular way to arrive in the country for travelers on an extended trip through Latin America. Most private boats charge about $400 per person, though it can vary depending on the size and quality of the vessel. Trips are typically 5 days, 4 nights, with a few of those spent exploring the San Blas Islands. This trip involves sailing in the open sea, which can cause even the sturdiest of stomachs to struggle with nausea. If this is you, be sure to take motion sickness pills. Old Cartagena is very much a walking city (within a city). Aside from a taxi to/from the airport or bus station, the area is best explored on foot. 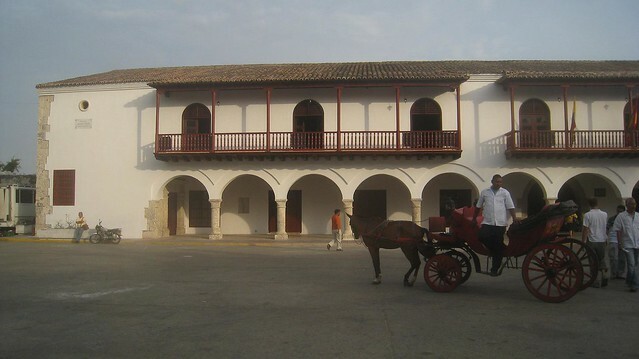 Within the old city walls, horse and carriages await both Colombian tourists and foreigners alike. Yes, it's as cliche as taking an overpriced gondola ride in Venice, however the carriages also add to the ambiance of the city, especially at night. If you want to go for a ride, try to pick a horse that looks healthy and well cared for. Taxis are an easy and inexpensive way to get around the larger metropolitan area. Taxis in Cartagena do not have meters, so be sure to confirm the price in advance, and try to bargain a little. Taxi drivers along the coast are more likely to quote inflated prices on account of all the tourists. The average cost of a ride is about 1,300 pesos ($0.80). View from Room 201 in Hotel Villa Colonial, barrio Getsemani. 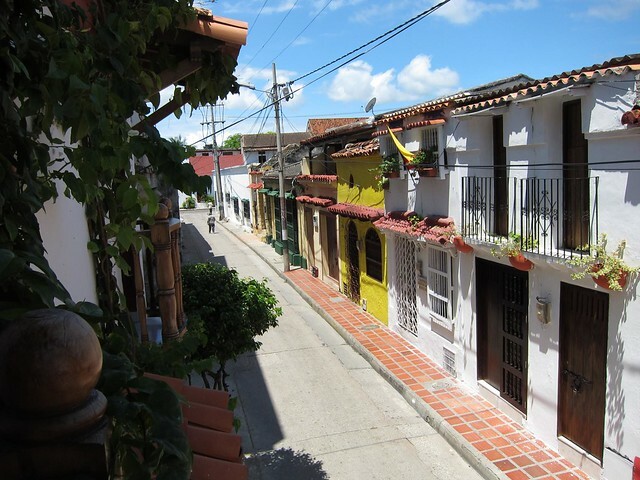 The main backpacker neighborhood, flush with hostels and cheap hotels, is Getsemani. It lies just outside the old city's main gate, and is a fairly safe walk day or night. At night, you may be propositioned by drug dealers and prostitutes, especially if walking alone. Simply ignore them, or a firm “no gracias” should be sufficient. Casa de la Chicheria – 38 – 34 Calle de la Chicheria, Centro. Hotel-style services at hostel prices. Casa Sweety – Calle del Guerrero #29B – 119, barrio Getsemani. Makako Chill Out Hostel – Calle Quero #9 – 54, Cartagena. Hotel Villa Colonial – barrio Getsemani. A wide range of inexpensive rooms. Try to get Room 201 with the private balcony. Couchsurfing is another option which can help you save money, and give you a chance to see the city through a resident's perspective. 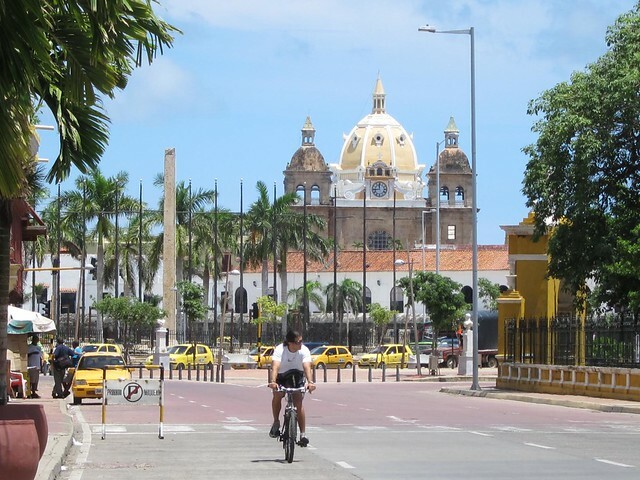 As most Colombians live with their parents until married, it may be hard to find a place to stay, however members of the Cartagena CS group get together regularly, so it can still be an easy way to meet the locals. Unlike other cities in Colombia where the focus is on nightlife, Cartagena offers plenty of things to see and do during the day. Historic Old City – Take your camera and go for a walk, preferably at dawn or dusk when temperatures are cooler and the natural light is ideal for photography. Castillo de San Felipe de Barajas – This old stone fortress is worth exploring, however even though it's on a hill, the city views aren't very picturesque. Try to get a photo under the gigantic Colombian flag on top. Beaches in Bocagrande – The easiest beaches to access are in Bocagrande, where the hotels, and high rise apartments are reminiscent of Miami. There are a mix of public and private beaches. Vendors selling ceviche and foot massages are among the most aggressive on the coast when it comes to pestering beachgoers. Ride on a Chiva Party Bus – Party like a local and join a colorful (if not cramped) chiva bus. Bring your own alcohol, and prepare to spend a few hours riding around the city with the vallenato and reggaeton music turned up loud. Playa Blanca – One of Colombia's prettiest beaches is a boat ride away from Cartagena. You can visit for the day, or spend a night or two in a hammock. Be forewarned, there's not much to do once the sun goes down. Islas del Rosario – Chain of islands located a short boat ride from Cartagena. Most organized tours include lunch, visit to the aquarium, and a few hours on Playa Blanca in the afternoon. Volcan del Totumo – About an hour outside the city by bus, you can take a dip in a volcanic mud bath, with a few dozen of your not-so-close friends. Shrimp ceviche with tortilla chips at La Cevicheria. Cartagena offers a wide array of restaurants to feed hungry visitors, with many of the best located within the historic old city. The city's proximity to Sea ensures fresh seafood is widely available. Ceviche – Raw seafood fans will delight in the availability of fresh ceviche, from vendors selling small cups on the beach to beautifully presented dishes in the city's fine dining establishments. Coconut rice (arroz de coco) – Coconut makes everything better, and this flavored rice is a coastal favorite. 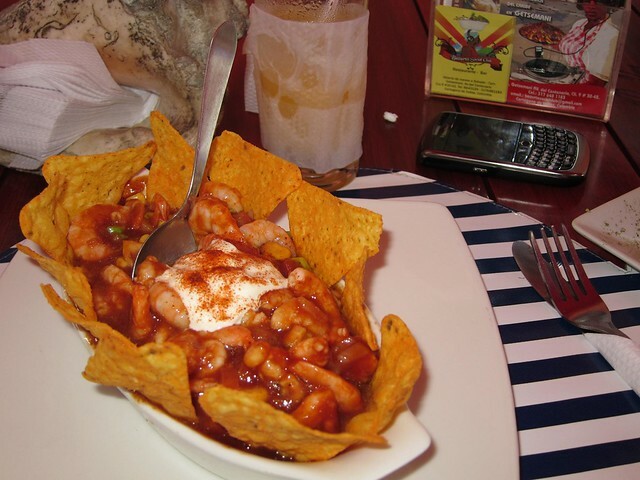 La Cevicheria – Calle Stuart #7 – 14, barrio San Diego, (in the north part of the Old City, Calle 39, between Carrera 7 + 8. Opposite Hotel Santa Clara). Featured on Anthony Bourdain's “No Reservations” TV program, this small ceviche restaurant serves giant, high quality portions. Most entrees can be shared by two people. Cafe Havana in barrio Getsemani is a popular nightspot for salsa dancing. Cartagena's bars and discotecas offer something for everyone, however the nightlife scene is nothing like the scale of what's available in the bigger cities of Bogota, Medellin and Cali. The city doesn't have a Zona Rosa, or main nightlife district, however most hotspots are centrally located. If you're staying in a nearby hostel, it'll be a short walk, otherwise hop in a taxi if you feel safer or are staying in Bocagrande. To gauge which clubs are hot at any given time, check out the ones being featured regularly on Pegateya. Cafe del Mar – Open air bar located atop the old stone wall, overlooking the Caribbean Sea. Enjoy a beer or cocktail, along with the breeze. This is THE place to be as the sun goes down, and the city lights up. 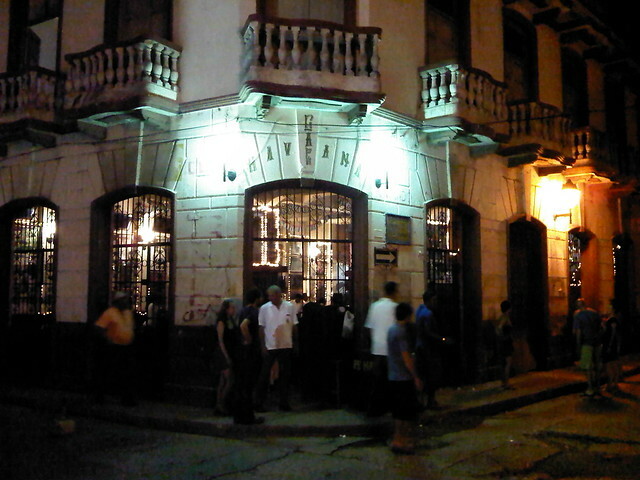 Cafe Havana – Intersection of Calle de la Media Luna + Calle del Guerrero, barrio Getsemani. Popular salsa bar, with live bands on the weekends. It gets very crowded with a mix of Colombians and tourists after 10 PM. Mister Babilla – Avenida del Arsenal #8B – 137, barrio Getsemani. Popular crossover club, similar to what you'd find in Cali or Medellin.